Grambling has been a Division I school for a long time, 40 years to be exact, but in all that time it had never won more than seven games in a row. Until Monday night, that is. GSU overcame a five-point second-half deficit for an 81-72 win over Alcorn State at home for its eighth win in a row. Shirmane Thomas scored 21 points to lead the team while Ivy Smith, Jr. scored 20 points, grabbed nine rebounds and dished off six assists. PINE BLUFF, Ark. – Fausto Pichardo recorded his first career double-double to lead Alabama State to a 65-59 road victory over Arkansas-Pine Bluff in Southwestern Athletic Conference (SWAC) play Monday night. Pichardo recorded a career-high 17 points and 15 rebounds for Alabama State (5-18, 5-6 SWAC), finishing the night 8-of-12 from the floor after going into halftime with nine points and eight rebounds. Reginald Gee went over the 600-point with 14 points and seven rebounds, while Tobi Ewuosho finished with 11 points and four assists in the win. Alabama State led for over 27 minutes in the contest, in a game that had two lead changes and seven ties. UAPB ran out to a seven-point lead in the first half, before Alabama State stormed back to take an eight-point lead in the second half with 14:38 to play. Meanwhile, Martaveous McKnight was frustrated all night defensively by the Hornets who switched off defenders – Gee and Terrance LeFlore – to finish with 20 points, including hitting 6-of-9 from the free throw line. He was held to just one rebound and three assists after a triple-double against Alabama A&M Saturday night. Travon Harper finished with 12 points, while Charles Jackson had 10. UAPB (9-16, 9-2 SWAC) shot 39.2 (20-of-51) percent from the floor and 20 (3-of-15) percent from beyond the arc. They also shot 64 (16-of-25) percent from the free throw line. JACKSON, MS– Trailing by two at halftime, the Jaguars (10-14, 6-5 SWAC) turned their up defensive effort and held the host Tigers to just 32 percent shooting to pick up the road victory at the Lee E. Williams AAC on Monday night. Jared Sam recorded another double-double with 18 points and 12 rebounds, Eddie Reese added 14 points and Chris Thomas scored 11 for the Jaguars. 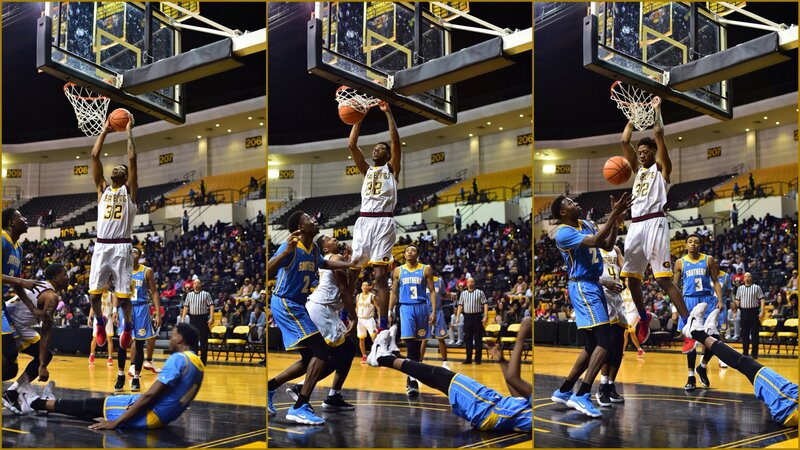 The Tigers (10-14, 7-4 SWAC) had three players reach double digits in scoring as Jeremiah Jefferson scored 12, Julian Daughtry had 11 and Maurice Rivers added 10. ITTA BENA, MS. – Deadlocked at 37 all at halftime, the host Delta Devils put together a strong second half behind Jordan Evans’ game-high 23 points and Dante Scott’s 16 points, five rebounds and five assists. Emmanuel Ejeh had nearly a double-double performance with nine points and 15 rebounds.